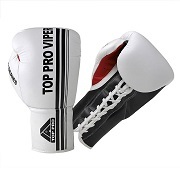 PROFESSIONAL LACED BOXING GLOVES. 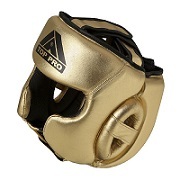 GOLD BOXING GLOVES. 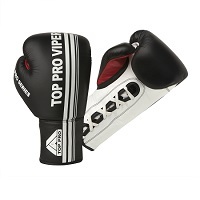 The TOP PRO VIPER Pro Fight Glove has been designed to provide the ultimate protection whilst conforming to the shape of the fist and delivering ultimate comfort and support. It has an improved pliable top grade leather helping to deliver more flexibility, durability and comfort. 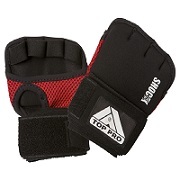 Also featuring the Multi Layering Core Foam that will increase metacarpel, knuckle and thumb protection without decreasing any of your 'punch' power! A super smooth lining has been included to provide increased comfort and dryness for the hand. 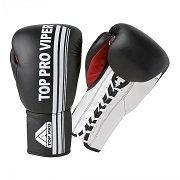 For the ultimate production this glove has been tested and approved by Champion & World Champions Fighters. * These are the Ultimate Puncher's Glove. * Designed Spec to Championship quality. * Manufactured with strict quality control. * Made from 100% Premium Cowhide Leather. * Inserted with Closed Cell Foam padding. * Complete with nylon satin water repellent lining. * Full protection against sweat entering the foam. * Excellent Thumb Protection for extra safety. * Special designed cuff for ultimate support. 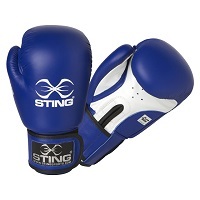 * These gloves should be for sparring only, NOT BAG-WORK. * SIZES AVAILABLE: 10oz, 12oz, 14oz, 16oz.